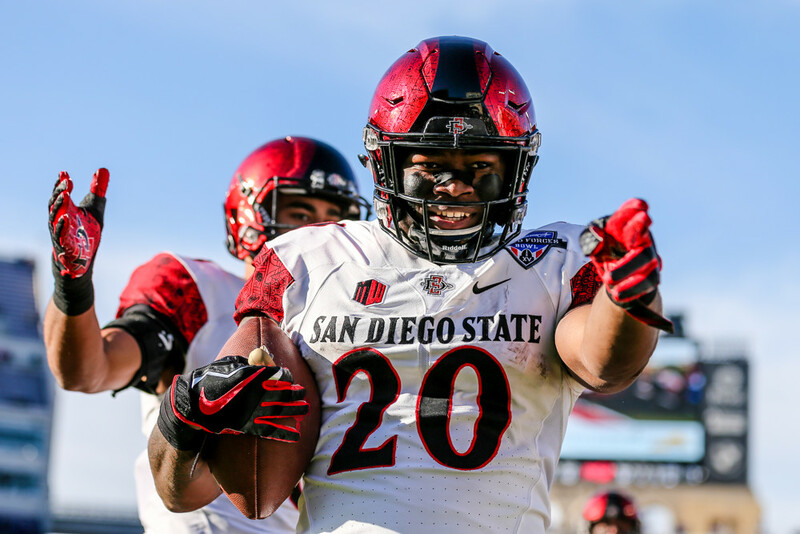 Despite big plays from senior running back Rashaad Penny, the San Diego State football team couldn’t contain Army’s last-second rally in the 42-35 loss at the Armed Forces Bowl on Saturday. After Penny ran for his fourth touchdown of the game to give San Diego State (10-3) a 35-28 lead with 5:47 left, Army (10-3) responded by driving the ball 72 yards for a touchdown. Darnell Woolfolk scored on a 1-yard run with 18 seconds left to move the Black Knights within one point of the Aztecs. In a gutsy play, Kell Walker took a pitch and ran untouched to the right for the go-ahead two-point conversion. The Aztecs then fumbled a lateral during a desperate final play that was recovered by Army’s Elijah Riley for a touchdown. Army’s option offense dominated the time of possession. The Black Knights’ drives were measured in minutes, while the Aztecs’ were measured in seconds. Army’s opening drive in the third quarter, for example, took 11 minutes and 19 seconds in a 15-minute quarter. In total, the Black Knights ran 91 plays in 46 minutes compared to the Aztecs’ 30 in 13:53. Coming into the game, SDSU was ranked ninth in the FBS in rush defense, allowing an average of 110.4 yards per game. In this game, however, Army ran for 120 yards in the first quarter alone and 440 overall. The star of the game for the Aztecs was, again, Penny. The senior running back rushed for 221 yards on 14 carries — his fifth straight game with 200 or more yards. Penny scored in every quarter, including an 81-yard TD on his first carry on the third play of the game. A 31-yard, 49-yard and 4-yard scoring runs would follow. Penny also added key blocks to allow Juwan Washington to score the Aztecs’ other touchdown on a 78-yard kickoff return. He also broke SDSU’s single-season rushing record set by Donnel Pumphrey last year with 2,248 yards. Penny was equally disappointed in not getting a win for his final college game but said the focus isn’t on him anymore. It’s on next year’s team.